in all 418 U.S. National Parks. Chimani is the leading developer of mobile apps to help you explore the outdoors. 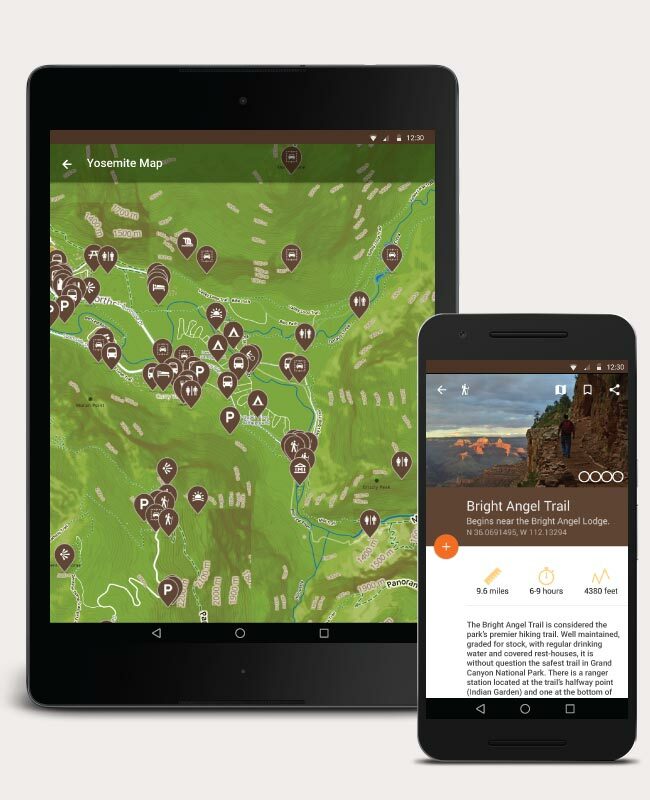 Our intuitive apps draw on the power of GPS-enabled interactive mapping technology to guide your outdoor adventures. Chimani’s outdoor travel apps include descriptions of points of interest, trails, amenities, and more. "No service" when you're out in the wilderness? No problem: Chimani’s apps work with or without WiFi or data signal. Chimani’s apps are offered as free downloads from the Apple Appstore and Google Play. The outdoors are what we love. It is our passion. But we love technology too! Combine the two and you have top-notch apps for exploring and touring the National Parks. We like to think of these apps as tools to help us navigate the natural world. All of this information is presented on an intuitive user interface that is visually well designed, includes professionally designed maps, up-to-date and well-researched content, high quality photographs and rock-solid programming. We are proud to have developed an incredible team to build Chimani, and we think you will find the apps useful and a great resource for exploring the outdoors. The National Parks are our passion. Whether it's backcountry hiking in the Grand Tetons, rock climbing in Yosemite, or bicycling the carriage roads of Acadia — these apps are made from personal experience. They are your travel guides, but you'll find a lot more than that. 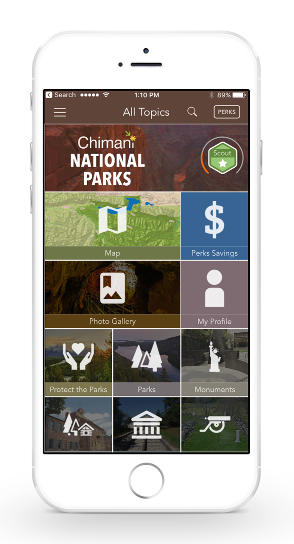 The National Parks by Chimani app includes information and photos on more than 400+ units of the National Park System, including national parks, monuments, seashore, historic sites, and more. The app also features maps, notifications about the latest park news, and the ability to earn and collect badges based upon the number of parks you visit. The first national park east of the Mississippi, Acadia is home to breathtaking Maine coastline and boasts over 50 miles of world-famous carriage roads for hiking and touring. Acadia also is the location of Cadillac Mountain, the first place the sun rises on the east coast of the United States. Arches is famous for its 2,000-odd namesake natural stone arches and whimsical rock formations of red, pink, orange, yellow, green, and grey stone. Amazing landscapes of giant sandstone fins, towering pinnacles and spires, and stunning balanced rocks captivate visitors exploring the park's hiking trails and scenic lookouts. Badlands National Park consists of 244,000-acres of striking geologic deposits and one of the world’s richest fossil beds. Visitors to this South Dakota park can experience front and backcountry camping and hiking, and wildlife including bison, bighorn sheep, and prairie dogs. A vast, protected wilderness area in north-central Maine, Baxter State Park is unique: the land was a gift to the people of Maine from just one person, Percival P. Baxter. The park covers more than 200,000 acres, encompassing its own mountain range dominated by Katahdin, Maine's highest peak. Big Bend National Park features temple-like canyons, a solitary mountain range, and a weather-beaten desert in southwestern Texas. Visitors to this park can experience backcountry camping and hiking, tenacious cactus blooms, and hundreds of bird species. Biscayne National Park protects one of the most extensive coral reef tracts in the world, the longest stretch of mangrove forest on the east coast, and 10,000 years of human history in South Florida. Visitors to this park can boat, dive, and camp in this mostly underwater park. Black Canyon of the Gunnison National Park offers some of the steepest cliffs, oldest rock, and craggiest spires in North America. Located in western Colorado, visitors to this park can hike, climb, fish, and river raft down the Gunnison River. Located in southwestern Utah, Bryce is home to distinctive geological structures called hoodoos -- slender, frost- and erosion-carved towers of rock in myriad and mysterious shapes filling a giant, natural amphitheater that can be explored on foot or horseback. Utah’s largest and most primitive national park, Canyonlands is 337,598 acres of sprawling and diverse splendor. Towering red rock cliffs, fantastical rock formations, hot dry vistas and verdant river banks offers sightseeing and activities for all ages and fitness levels. Carlsbad Caverns National Park features ancient sea ledges, deep rocky canyons, and more than 119 known caves just north of the border between Texas and New Mexico. Visitors to this park can hike, climb, camp, and explore the vast network of caves. Cape Cod National Seashore encompasses over 40 miles of Atlantic Ocean beachfront and 43,500 acres of ponds, woods, and meadows in Cape Cod, Mass. In addition to its own hiking and biking trails, the Seashore is also the terminus of the famous Cape Cod Rail Trail, a 22-mile paved biking/hiking/running path used to access the Cape’s many beaches. Capitol Reef National Park is located on the Waterpocket Fold, a geologic wrinkle on earth. Visitors to this park in south-central Utah can hike to cliffs, canyons, domes, and bridges, in the heart of red rock country. Channel Islands National Park consists of five unique islands located off the coast of southern California. Visitors to this park can hike, climb, camp, and explore the park, which is home to many animal species including the Island Fox. Congaree National Park is the largest intact expanse of old growth bottomland hardwood forest remaining in the southeastern United States. Visitors to this park can hike, camp, and explore the park, located in South Carolina. Crater Lake National Park is a stunning outdoor classroom filled with two thousand foot cliffs, a crystal clear lake, and a violent volcanic past. Visitors to this park can hike, camp, and explore the park, located in Oregon. Home to the winding Cuyahoga River, Cuyahoga Valley National Park in northeastern Ohio is an urban/rural oasis with over 51 square miles of hiking, biking, and bridle trails, as well as canals and, unique to the U.S. national parks, its own scenic railroad. Death Valley is a land of extremes: it’s among the driest and hottest places on Earth, and visitors can take in both the lowest and highest points in the continental United States in a single view. Yet this is also a place of rugged beauty that has long drawn dreamers, fortune-seekers and solitude lovers to its dune fields, endless salt flats, and rugged canyons. Tundra, rivers, glaciers, and North America’s tallest peak all help comprise Denali National Park, the most-visited national park in Alaska and a six-million-acre wilderness populated with bears, wolves, caribou, and an abundance of other wildlife. Dry Tortugas National Park is a secluded island park surrounded by coral reefs and marine life, 70-miles off the tip of Key West, Florida. Visitors to this park can hike, camp, snorkel, and explore the park that is only accessible by boat or seaplane. Everglades National Park is the largest subtropical wilderness in the United States. Visitors to this park can hike, boat, camp, and explore the park, which is home to many animal species including the manatee, American crocodile, and the elusive Florida panther. Gates of the Arctic National Park is a vast intact roadless ecosystem where people have lived with the land for thousands of years. Visitors can meander along wild rivers winding through glacier-carved valleys. The adventure is limitless in Glacier Bay National Park with 3.3 million acres of rugged mountains, dynamic glaciers, temperate rainforest, wild coastlines and deep sheltered fjords in southeast Alaska. Montana’s million-acre Glacier National Park includes parts of two mountain ranges, over 130 lakes, more than 1,000 different species of plants, and hundreds of species of animals. Visitors can explore the "Crown of the Continent Ecosystem" on the famous Going to the Sun Road and more than 700 miles of hiking trails, passing deep forests, open alpine meadows, high peaks, and of course the park’s 35 namesake glaciers. 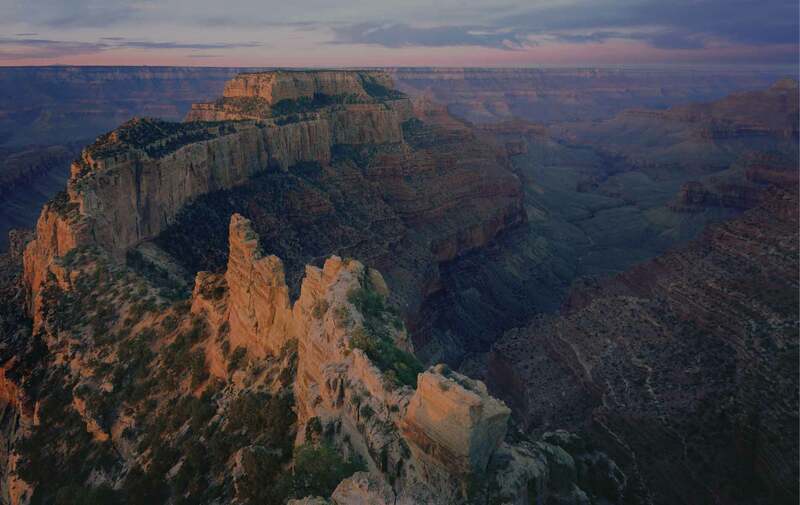 The magnificence and beauty of the Grand Canyon in Arizona draws more than four million visitors each year: many come simply to take in the awe-inspiring views from the South Rim, while the more adventurous venture down into the canyon to explore or visit the far-less-crowded North Rim. A near neighbor to Yellowstone but with glorious scenery of its own, Grand Teton National Park includes the major peaks of the 40-mile-long Teton Range as well as most of the northern sections of Jackson Hole valley. Visitors to this 31,000-acre park can scale the heights of 13,770-foot Grand Teton, hike to the Jenny Lake overlook, or thrill to a float trip on the Snake River, among the park’s many and diverse experiences. Great Basin National Park lies in the shadow of 13,063-foot Wheeler Peak, where 5,000 year old bristlecone pine trees grow on rocky glacial moraines, and the beautiful Lehman Caves wait below. Great Sand Dunes National Park is home to the tallest dunes in North America, the centerpiece in a diverse landscape of grasslands, wetlands, conifer and aspen forests, alpine lakes, and tundra in Colorado. A UNESCO World Heritage Site, Great Smoky Mountains National Park straddles the ridgeline of the Great Smoky Mountains, on the border between Tennessee and North Carolina. The most-visited national park in the U.S., Great Smoky attracts nature lovers to its peaks, hills and “hollers” with an abundance of wildlife, deep forests and serene waterfalls, extensive hiking trails, and reminders of the rugged mountain folk who once inhabited these lands. Guadalupe Mountains National Park in West Texas is home to the world’s premier fossil reef from the Permian Era. Visitors travel from around the world to view the birds and other wildlife in this pristine wilderness. Haleakala National Park is located amid stark volcanic landscapes and a sub-tropical rain forest. Visitors to this park on the Hawaiian island of Maui can experience backcountry hiking, endangered species unique to the park, and ancient and modern Hawaiian culture. Hawaii Volcanoes National Park displays the results of at least 70 million years of volcanism, migration, and evolution on the island of Hawaii. Visitors to this park can experience two of the world's most active volcanoes, backcountry hiking, endangered species unique to the park, and ancient and modern Hawaiian culture. Hot Springs National Park is a unique natural and historical wonder, located in the heart of downtown Hot Springs, Arkansas. Visitors to this park can experience the soothing thermal waters at one of the world-famous bathhouses along Bathhouse Row, or hike one of the park’s many trails. Isle Royale National Park located in Lake Superior, Michigan is a rugged, isolated island wilderness that is ideal for backpackers, hikers, boaters, kayakers, canoeists and scuba divers. Joshua Tree National Park is named for the iconic yuccas that dot the park landscape, their arms seemingly reaching heavenward in prayer. Visitors to this Mojave Desert park in southern California can hike to groves of Joshua Trees and hidden oases, explore remote backroads and former mining camps, and indulge in some of the best climbing and bouldering routes in North America. Katmai National Park in Alaska is an active volcanic landscape in Alaska, that protects 9,000 years of human history. Kenai Fjords National Park is the land where the ice age lingers. Roughly 40 glaciers flow from the Harding Icefield into the icy waters off the Kenai Peninsula in Alaska. Kobuk Valley National Park in Alaska is a remote destination where sand dunes rise above the Arctic Circle, and wild caribou roam a roadless natural landscape. Lake Clark National Park located in Alaska is a land of stunning beauty where volcanoes steam, salmon run, bears forage, and mountains reflect in shimmering turquoise lakes. Lassen Volcanic National Park is home to steaming fumaroles, meadows freckled with wildflowers, clear mountain lakes, and numerous volcanoes in California. Mammoth Cave National Park is home to the world's longest known cave system, with more than 400 miles explored in Kentucky. The cave’s vast chambers and complex labyrinths have earned its name - Mammoth. Mesa Verde National Park in Southwest Colorado was home to the Ancestral Pueblo people for over 700 years. Today, the park protects 5,000 archeological sites, including 600 cliff dwellings. Mount Rainier National Park -- centered on a majestic, 14,000-foot volcanic peak girded with dozens of glaciers -- welcomes visitors with a vast array of outdoors activities, from easy strolls through subalpine meadows to two-week-long backcountry hikes on the Wonderland Trail and challenging climbs to the top of the highest mountain in the Cascades. Mount Rushmore National Monument is iconic in every sense: carved into the Black Hills are the faces of four of the greatest Presidents of the United States, and the monument itself is among the most famous symbols of American democracy, rivaled only by the Statue of Liberty. Park visitors can get up-close views of Washington, Jefferson, Lincoln and Roosevelt and learn how these massive graven images were created. National Park of American Samoa is home to pristine beaches, coral reefs, and rich cultural heritage. Visitors to this park can hike, climb, camp, and explore the park located in the South Pacific. North Cascades National Park in Washington is an vast alpine landscape, located three hours northeast of Seattle. From Pacific coastline to temperate rainforests, dry woodlands to glacial heights, Olympic National Park’s diverse landscape draws everyone from sunbathers to mountain-climbers to enjoy a vast, protected wilderness in Washington state -- much of it accessible only on foot. Hundreds of millions of years ago, a forest of towering trees stood in what is now arid Arizona grasslands: we know this because everywhere in Petrified Forest there are fossilized logs, eternally preserved in quartz. Park visitors can stroll among these ancient trees, take a driving tour featuring marvelous vistas of the Painted Desert, and learn how humans have adapted to this challenging climate for 16,000 years, from the first nomads following the Ice Age to those following the Mother Road, Route 66, which passes through the park. Pinnacles National Park in California is a unique volcano formed landscape where visitors enter rare talus caves and emerge to towering rock spires teeming with life. Redwood National Park in Northern California is home to the tallest trees on earth, along with vast prairies, oak woodlands, wild riverways, and nearly 40 miles of pristine coastline. Rocky Mountain National Park, located in the north-central region of Colorado, features majestic mountain views, a variety of wildlife, varied climates and environments (from wooded forests to mountain tundra), and easy access via 355 miles, a pair of scenic roads, and camping in established campgrounds and the backcountry. Saguaro National Park is home to the nation’s largest cacti, the Giant Saguaro, found only in a small portion of the United States, just outside of the modern city of Tuscon. Sequoia and Kings Canyon, twin parks located in the southern Sierra Nevadas of California, the two parks, are home to groves of Giant Sequoia trees -- among the oldest and largest living things on Earth -- as well as deep glacial canyons with towering granite cliffs waiting to be explored. Shenandoah National Park is home to cascading waterfalls, spectacular vistas, quiet wooded hollows, iconic Skyline Drive, and 200,000 acres of protected lands in Virginia. Theodore Roosevelt National Park is a remote, rugged landscape in North Dakota. The area greatly impacted Theodore Roosevelt during a bison hunt in 1883 when he was a young man. Virgin Islands National Park is located amid more than 7,000-acres of hills, valleys, and beaches on the island of St. John. Visitors to this park can experience backcountry hiking, pristine beaches, and a complex history of civilizations dating back more than a thousand years. In Voyageurs National Park in Minnesota, you can see and touch rocks half as old as the world and set out on the water highways of the North Woods. Wind Cave National Park and the Black Hills is home to rolling prairie grasslands, forested hillsides, and one of the longest and most complex caves in the world in South Dakota. Wrangell-St. Elias National Park in Alaska is America’s largest national park. At 13.2 million acres, the park is as large as Yellowstone National Park, Yosemite National Park, and Switzerland combined. The world’s first national park has been wowing visitors since 1872 with its incredible landscape of spewing geysers (Old Faithful being the most famous), colorful pools and hot springs, and of course the buffalo, wolves and bears that call this 3,468-square-mile park in Wyoming home. Located in California and covering over 761,000 acres, Yosemite is one of the most visited national parks in the country. The famous vistas of the Yosemite Valley -- with Half Dome, El Capitan, and Yosemite Falls framing and feeding the Merced River -- alone are worth the visit, but you can also explore a vast wilderness area and groves of Giant Sequoia trees. Having a problem? Want to learn more? Don't hesitate to email if you can't figure out something! You'll get a speedy response (we're sorta famous for that). We also have a YouTube Channel with numerous "how to" vidoes. We don't have a user manual but we do have a YouTube Channel with numerous "how to" vidoes. I purchased a subscription but why am I still getting the payment screen? You want to be sure to log in to the account you used to purchase your subscription. Be sure to click on the My Profile section and follow the instructions. Here's a how-to video to help. If you're still having problem, be sure to email and we'll sort things out. If you purchased your subscription within the app, you'll need to contact Apple directly to request a refund - unforutnatley we don't have any ability to do this. If you purchased your subsctiption via our website, please email us directly. Why was I charged for a subscription? There is a three-day free trial for the subscription however if you don't cancel it by the end of the thrid day Apple will charge you for the annual subscription. You'll need to contact Apple directly to request a refund - unforutnatley we don't have any ability to do this. Where did all your individual apps go and I thought everything was free? In the fall of 2018 we consolidated all our iOS/Apple individual apps into one and introduced a subscription revenue model. In order to continue to support and develop all the app and guides, we needed to introduce a low-cost revenue model. We plan to complete the consolidation and subscription revenue model on the Android apps by the summer of 2019. I don't see any Ranger Events Listed. Ranger events are processed by Chimani as soon as they are available from the National Park Service. Check back often to see if new items have been added to the list of events. I see an "Updating Data" notification that never completes. While you may still see the notification, the sync process has completed and the app is no longer downloading data. You can clear this notification in a couple of ways. You can swipe it away or use the clear all button. Can I download the maps in National Parks by Chimani? The maps in National Parks by Chimani are online only. For offline maps please use the detailed guide app for a specific park. I downloaded your app, am I ready to use it in the park? Do I need to do anything else? Yes, but to ensure an even better experience, we recommend downloading the detailed map for offline use. To do this, open Map and click on the top right menu option (iOS) or the download option (Android) in order to download the maps for offline use. I think you are missing information or have something incorrect in the app. Let us know by using the contact us button on the about us section of the app or email us at editor@chimani.com. We make updates frequently to bring you the latest information.